Step 1. Paint the wooden reindeer head and allow to dry. Step 2. Cut out a body from a sheet of cover paper and glue to the back of the head. Step 3. Fold a chenille stem in half and glue to the back of the body for the legs. Step 4. Draw the eyes and nostrils on the head with Posca Markers. Step 5. Draw patterns on the antlers with Posca Markers and Kindyglitz. Step 6. 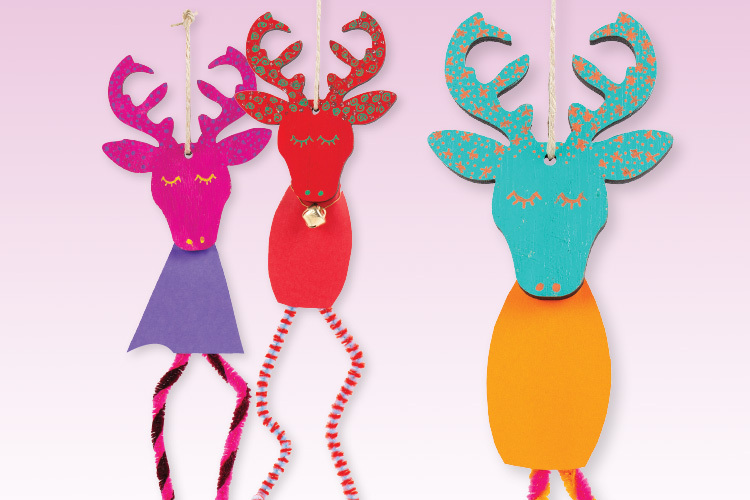 Thread a length of jute string through the hole to create a loop to hang the reindeer.